It is a project that would create tens of thousands of jobs, and not cost our state government one cent. But Bishop went back on his word, and refused to allow a vote. Soon, it was reported by the Gongwer News Service that in just a few months Moroun had given more than $150,000 in political contributions, many to committees under Bishop’s control. It looked like our entire political system had been successfully corrupted by a greedy billionaire, who was sabotaging Michigan's economic future. The government of Canada was stunned. It looked like our entire political system had been successfully corrupted by a greedy billionaire, who was sabotaging Michigan’s economic future. But then Rick Snyder was elected governor. He found a legal way to make a deal with Canada that would allow the new bridge to be built. About all that remains to make the bridge reality is for Washington to approve funds for the customs plaza any international border crossing requires. Politically, these were also bad years for Mike Bishop. After he was term-limited out of the legislature, the Republican Party denied him its nomination for attorney general. The Snyder administration had no place for him. He ran for Oakland County prosecutor and was badly defeated. Yet this year his career was suddenly resurrected, thanks to Congressman Mike Rogers’ decision to leave office to host a radio talk show. Bishop won the Republican nomination to replace him. His opponent, Ingham County treasurer Eric Schertzing, is a moderate Democrat committed to middle class tax reform. But it is a mostly Republican district, and the odds favor Bishop. 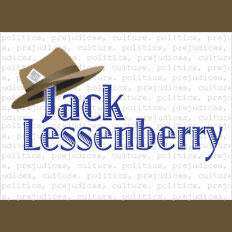 And he has made it clear that he will be the congressman for Matty Moroun. Bishop has said he will do what he can to stop federal funding for the new bridge’s customs plaza. According to the Federal Election Commission, the Moroun family and that of his top aide, Dan Stamper, have personally given at least $18,000 to Bishop’s congressional race. In return, Bishop is repeating the canard that Moroun should be allowed to build a second bridge next to his own instead. That’s something that sounds good only to the ignorant. Twinning the second bridge would be an environmental, logistical and traffic-snarling nightmare. Canada would never allow it. Nor should they. Voters in the 8th Congressional District seem to be about to elect a congressman who is in the pocket of a family bent on killing a project needed for Michigan’s economic future. I wonder how many of them know. Gov. Rick Snyder told a business conference in Grand Rapids today that he expects the new international border crossing between Detroit and Ontario will provide a boost to the entire Michigan economy. The bridge will be largely financed by the Canadian government, which agreed to pay for both sides of the bridge after the Michigan Legislature balked at funding the project. 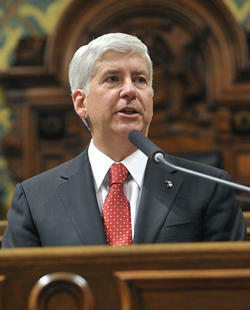 However, Snyder believes it to be the United States' responsibility to to pick up the costs of the U.S. customs plaza.